After my recent trip to Israel, where I spent time with our FIDV colleagues Ilan Egozi, Ora Seidner, Ruti Tali Keren, Shimon Navon (Chairman of the Board of Directors) and Dan Layani (Deputy Chairman of the Jerusalem District of the ZDVO), I know how important our work at FIDV is, and that we are fortunate to have so many good people working with us! I experienced the great impact of our daily work at Beit Halochem. I spoke with disabled veterans who consider Beit Halochem a second home, a special place of healing and acceptance, a place to learn how to use all one’s skills to build new lives, new professions, and a new sense of community. From the new construction at the Beit Halochem Jerusalem, to the special programs for the young, our services are vital. I am eager, too, to see the construction of the new Beit Halochem Ashdod begin, because it will bring Beit Halochem to residents in the south of Israel. Of course for FIDV-Beit Halochem the ongoing need to help brings its own tremendous challenges. 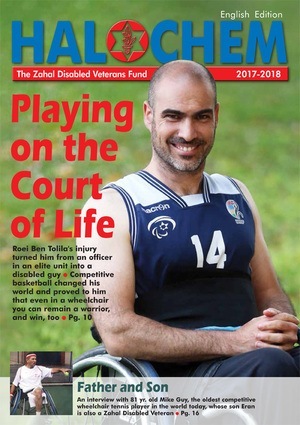 The community of disabled veterans at Beit Halochem, from the oldest who served in the war of Independence to the newest injured, is a strong one. Each person tries to help the others adjust to the complex world of disability while also creating bonds of friendship that connect everyone. It is indeed a House of Warriors – warriors fighting to get their lives back. How can I explain how I felt when our Beit Halochem wheelchair ballroom dance champion Anna, injured in the Netanya bombings, did a special performance for me. Anna embodies courage, beauty and hope, and meets each day, each challenge, with help from her friends at Beit Halochem. I am proud to be part of the worldwide network that supports Beit Halochem; if we keep working together to make all our services, programs and special individualized rehabilitation therapies happen, lives will change and doors will open. During my trip I also had the opportunity to meet with several of the veterans who call Beit Halochem their “second home”. For them each day means new things to try, therapies to heal them, friends to talk to. I want to thank them for sharing their stories with me. I know that they have given so much by serving, and we will be there for them, whenever they will need us. And that is now. We are all part of the same FIDV-Beit Halochem family. This is a partnership for life! If you are reading this for the first time, please become a partner with FIDV now by join our mailing list or calling us at 212-689-3220. Together we can accomplish so much.